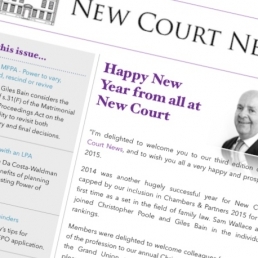 The February 2016 edition of our Newsletter, New Court News, is now available.  “Misuse and abuse of s.20…will no longer be tolerated – Re N”. Here, new tenant Sabrina Polak looks at the implications for this far-reaching judgment on care proceedings.  “Internal Relocation.” Stephanie Hine looks at the recent decision of Re C and the judgment of Lady Justice Black in reaffirming the law in respect of internal relocation within England & Wales. “Financial Security for Child Arrangements.” Katherine Couper considers the measures open to the court to ensure compliance with Child Arrangements Orders when children move abroad with one parent. To subscribe to our newsletter and receive a copy by email, just fill in your details here. 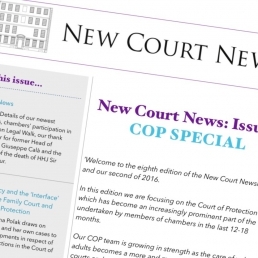 The June 2016 edition of our newsletter, New Court News, is now available. 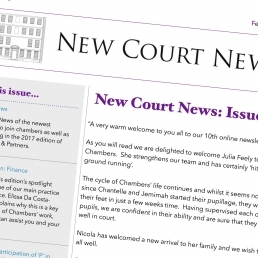 The February 2017 edition of our Newsletter, New Court News, is now available, featuring the latest news from New Court Chambers and articles by Elissa Da Costa-Waldman (Finance), Jemimah Hendrick (Court of Protection) and Sam Wallace (Care Proceedings).